Loaded and ready to roll…. I’m off….. Of to Charleville. So, I’ve picked a typer to go. It was a tough decision between all my machines, but the Quiet-riter wins out. Sure, it’s barely portable – but I’m not going trekking over any dunes and mountains, and through fiercely dense Rain Forests. No, it is sitting in the footwell just behind my drivers seat. All the creative hardware I want with me on this occasions. 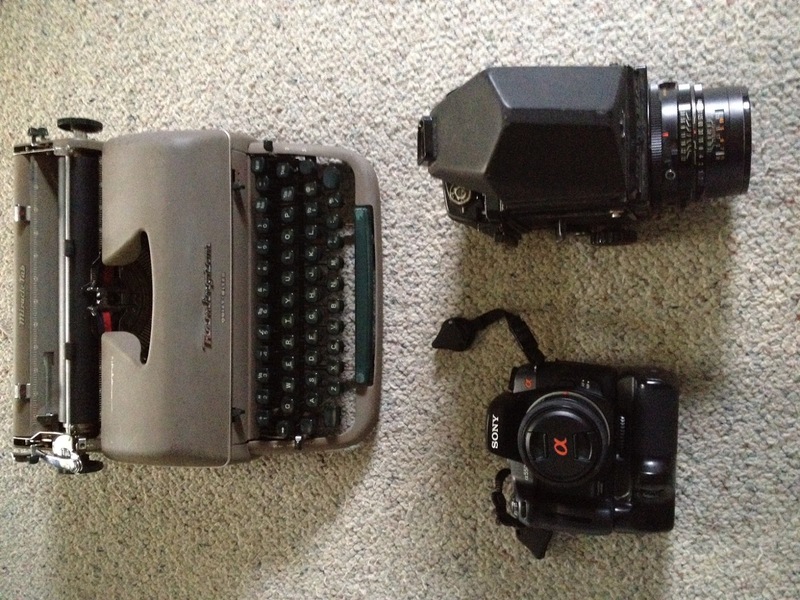 And no, the Medium Format camera isn’t bent. it is just distortion from my phone camera. I’m dropping a camper and their gear (a sh*tload of gear) out to a campsite at lake Sommerset on the way, so my stuff actually is very tightly bundled up in the Exxy at this stage. I also won’t have mobile reception – and as such 3G reception till I get back at least as far as Roma, so I’m going to be largely off the grid for a little bit. So folks, see you when I’m back. July 18, 2012 in cameras. camera, exxy, loaded, packed., travel, Trip. quiet-riter, typewriter. ← ‘The Mystery Part’, or…. ‘The Six Million Dollar Typewriter’. Nice gear! Enjoy the trip! Envious – enjoy the trip! I'm looking forward to a typed report! Have fun and good luck lugging that Quiet-Riter! I like the description of this machine from your selection post: “word tractor”. I hope it is a good companion on the road. You've got a nice blend of analog and digital technology in your travel kit. Okay, at least it's unpredictable, you chose the heftier typewriter. Enjoy! Thank you very much sir. I sure did! Well, it was quite fun! Don't be too envious, it was too short. It is coming….. Believe me. I wish I had a digital back! But no….. Actually, I had some issues with the camera's back rotator, and mostly set it aside. I ended up using my DSLR and iPhone largely. The Quiet-riter was no problem at all. But, I kind of regretted not having the baby, only because I came across one special little baby along the way. Thanks for not picking up on my dodgy grammar! And yes, it certainly is my 'Word tractor', and it worked flawlessly. Despite being in some nasty wind at some point. Hefty was good. In the back of my car, it was perfect.